An eco-resort is being built on Little Corn, a result of The Corn Islands being a national tourism heritage site. If you like peaceful beach living, white sands, and blue seas, then you might want to check out Nicaragua's Corn Islands. Reminiscent of Belize 's Ambergris Caye 30 years ago or Honduras ' Roatan island 25 years ago, this is a spot for pioneering castaways. The Corn Islands offer a healthy reef for scuba diving, snorkeling, fishing, and lobstering, friendly locals who speak English as their official language, and very few tourists. Thanks to surrounding coral reefs these islands are the best places to spot hammerhead sharks, eagle rays, greens sea turtles, and more. These two little dots of paradise are located less than 50 miles off Nicaragua 's Caribbean coast. 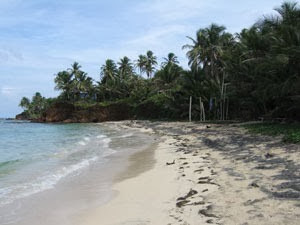 Big Corn Island is about four square miles in size and has maybe 6,000 inhabitants. It's just 10 miles from Little Corn which is one-fourth the size of Big Corn in both land mass and population. How they came to be called the "Corn Islands" is a mystery. Some say pirates and British buccaneers, who came here to restock supplies during the 17th and 18th centuries, misspelled the Spanish word for meat, carne. Others say they're named for the corn found growing here. Lobstering is the main industry and one expat who lives on Big Corn told me, "We eat lobster with eggs for breakfast, we have lobster with pasta, with rice, with fruit… We experiment with lobster in just about every dish you can imagine." The airstrip on Big Corn is being lengthened to accommodate international flights, to make the exportation of fresh lobster directly to market in Miami easier. Improvements to the hospital are also being made to comply with associated regulations. Will these upgrades and developments bring more tourists to the area? Probably. Although these islands aren't for everyone. Supplies have to be imported if they aren't locally grown or caught from the waters. Restaurants all tend to serve variations of the same dishes, with few exceptions. You won't find many tourist businesses or souvenir shops except for a few hotels and guesthouses. Coffee shops and Internet cafés are rare and Internet won't be what you are used to at home. There are no roads on Little Corn, just a three-foot-wide sandy walkway. No vehicles are allowed although a new upscale eco-resort is in the works. Nicaragua's National Assembly has declared the Corn Islands a site of national tourism heritage, with the aim of enticing investment and boosting hotel capacity. If you are an adventuresome soul and the pioneering sort, my advice is to go sooner rather than later. Prices are low for now. A quarter-acre lot with a million-dollar view of the Caribbean can be had for just $35,000. To get to the Corn Islands, you can fly directly to Big Corn from Managua, expect to pay about $180 for a round-trip ticket. To get to Little Corn, take the 30-minute local water taxi from Big Corn for about $7 per person. Editor's Note: Learn more about Nicaragua and other countries in our daily postcard e-letter. Sign up for IL's free daily postcard here and we'll send you a FREE REPORT- Start a New Life on the Beach in Nicaragua.